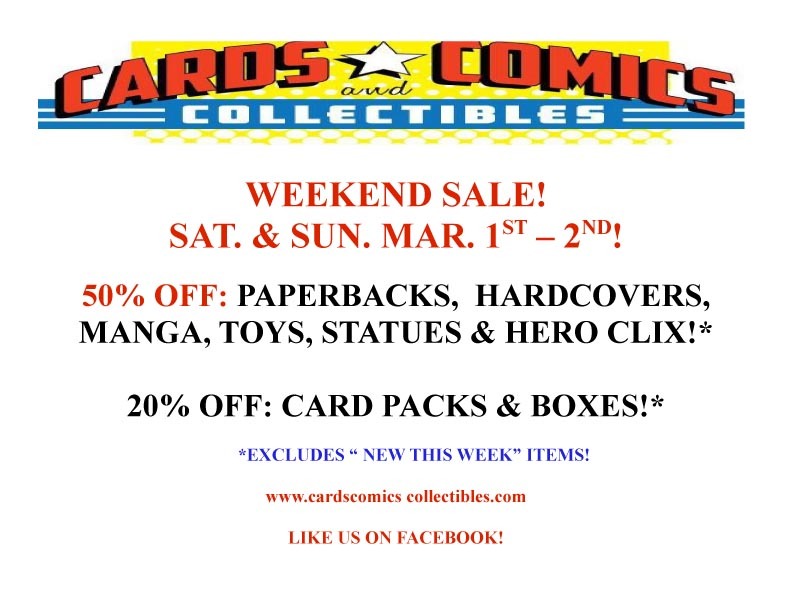 SALE MARCH 8 & 9! Comments Off on SALE MARCH 8 & 9! WE HAVE RESTOCKED THE BARGAIN BOOKS TABLE! SAT. & SUN. MARCH 8TH & 9TH ! 20% OFF: CARD PACKS & BOXES*! *EXCLUDES “NEW THIS WEEK” ITEMS! CHECK OUT OUR BARGAIN BOOKS TABLES! LOOK FOR SPECIALLY MARKED DOWN ITEMS THROUGHOUT THE STORE! MEET SEAN CHEN & JAMES KUHORIC! Comments Off on MEET SEAN CHEN & JAMES KUHORIC! 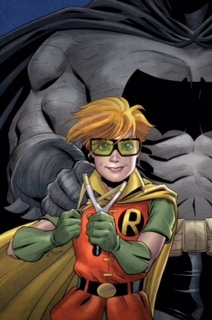 IN STORE SIGNING AT Cards Comics and Collectibles! SATURDAY MARCH 15TH! 12 -4 PM! 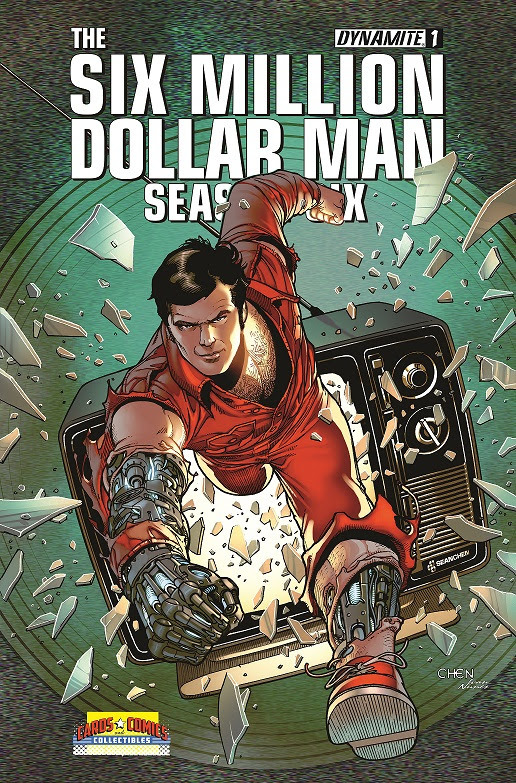 JOIN US AND Dynamite ENTERTAINMENT FOR THE LAUNCH OF “SIX MILLION DOLLAR MAN SEASON SIX” ! 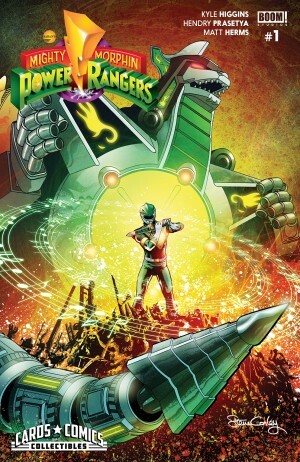 SEAN IS THE COVER ARTIST OF THE CC&C EXCLUSIVE COVER FOR ISSUE #1! COME IN STARTING WENESDAY THE 10TH TO GET YOUR COPY! SEAN IS ALSO THE ARTIST OF OUR “TUROK” EXCLUSIVE! LET THE MADNESS OF MARCH BEGIN! Comments Off on LET THE MADNESS OF MARCH BEGIN! SAT. & SUN. MAR. 1ST – 2ND! *EXCLUDES “ NEW THIS WEEK” ITEMS! 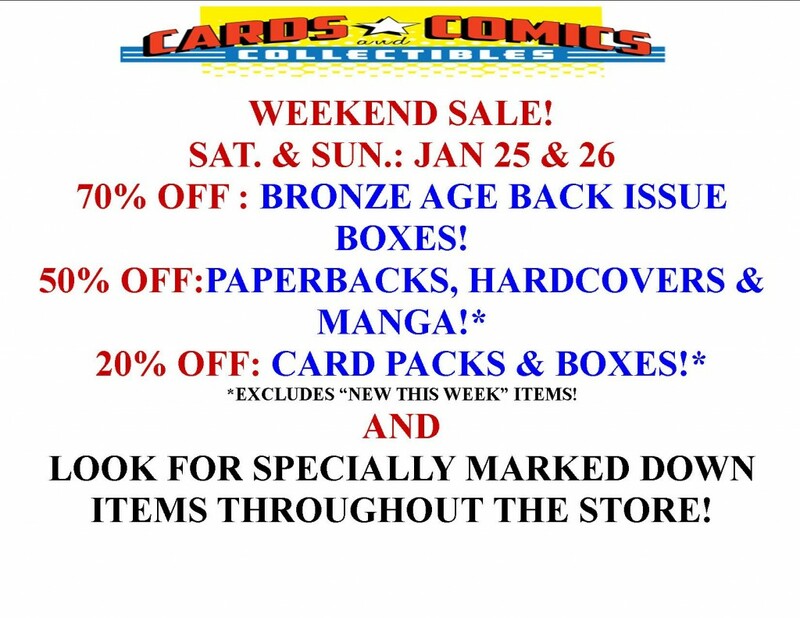 70% OFF: BRONZE AGE BACK ISSUE BOXES! 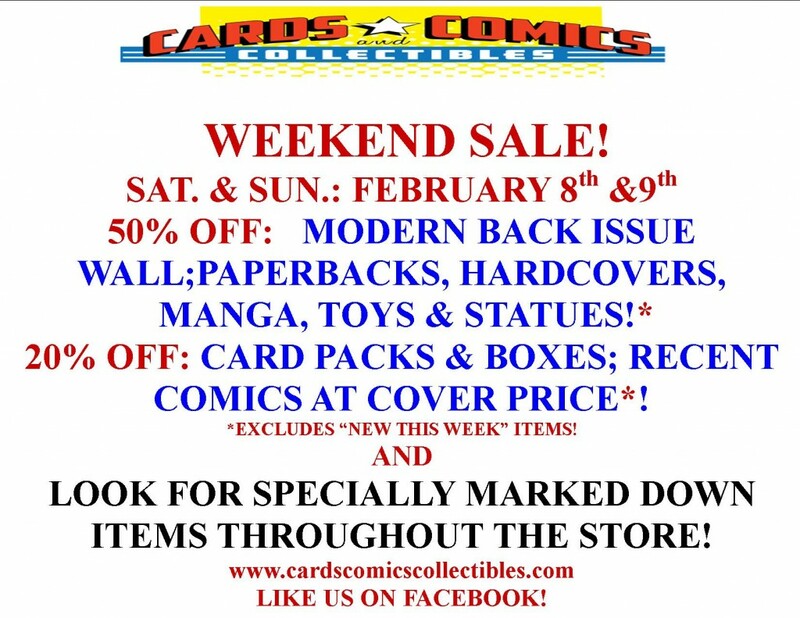 Comments Off on SALE FEB. 8-9! 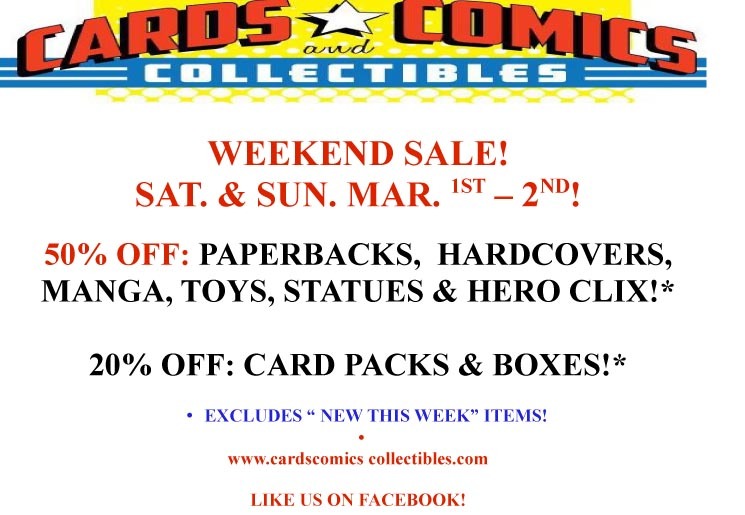 20% OFF: CARD PACKS & BOXES; RECENT COMICS AT COVER PRICE*! 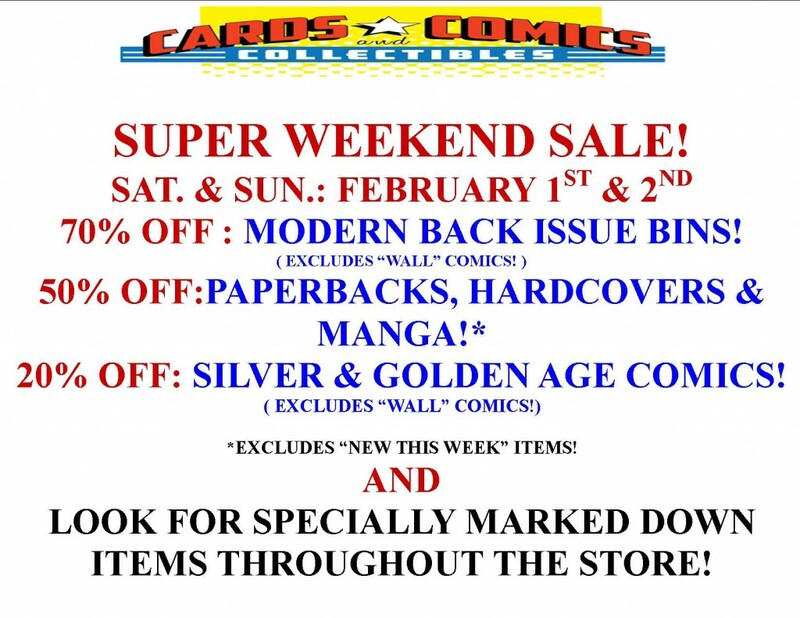 SUPER WEEKEND SALE! FEB. 1-2! Comments Off on SUPER WEEKEND SALE! 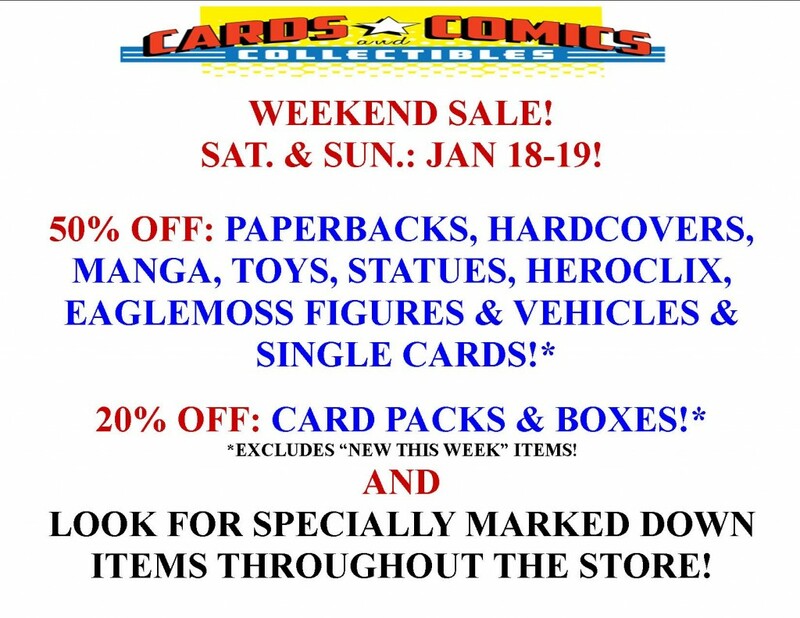 FEB. 1-2! 70% OFF : MODERN BACK ISSUE BINS! 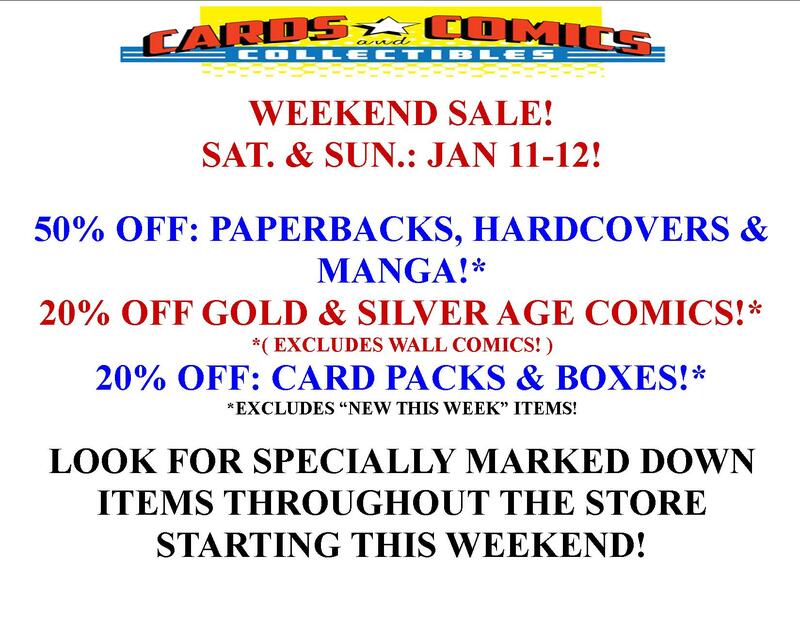 20% OFF: SILVER & GOLDEN AGE COMICS! SALE ! JAN. 25 &26! Comments Off on SALE ! JAN. 25 &26! 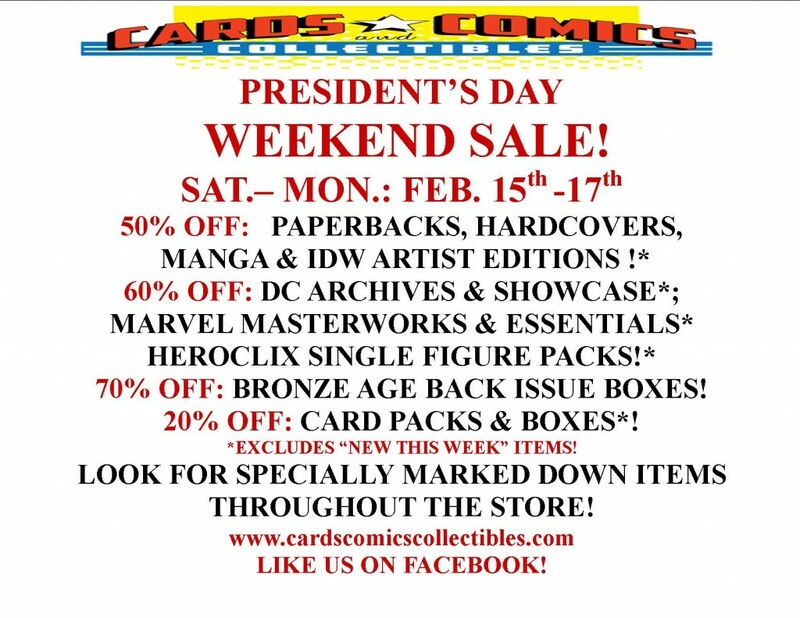 70% OFF : BRONZE AGE BACK ISSUE BOXES! SALE ! JAN. 18 – 20! Comments Off on SALE ! JAN. 18 – 20! 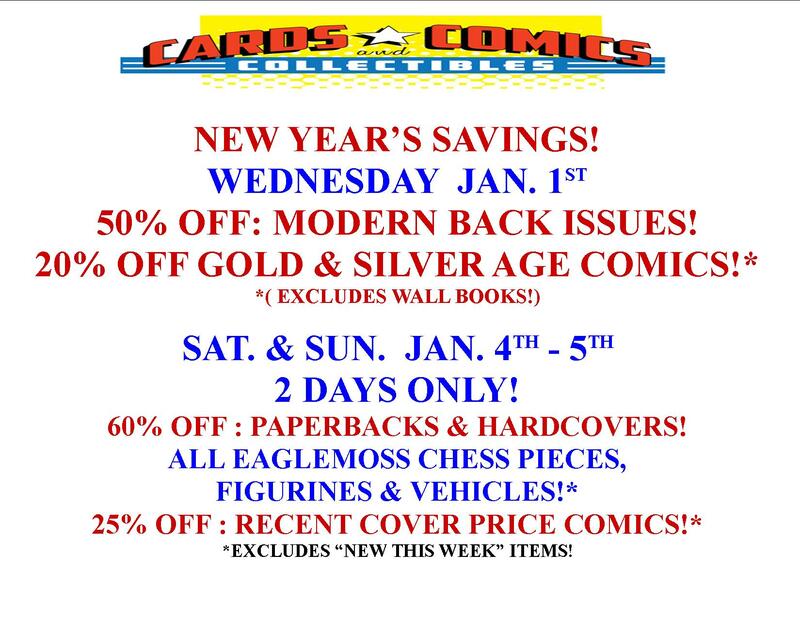 EXTENDED TO MONDAY JAN. 20! SAT. & SUN. : JAN 18-19! Comments Off on SALE JANUARY 11 &12! SAT. & SUN. : JAN 11-12! Comments Off on NEW YEARS’S SAVINGS! OUR FIRST SALES OF THE NEW YEAR!